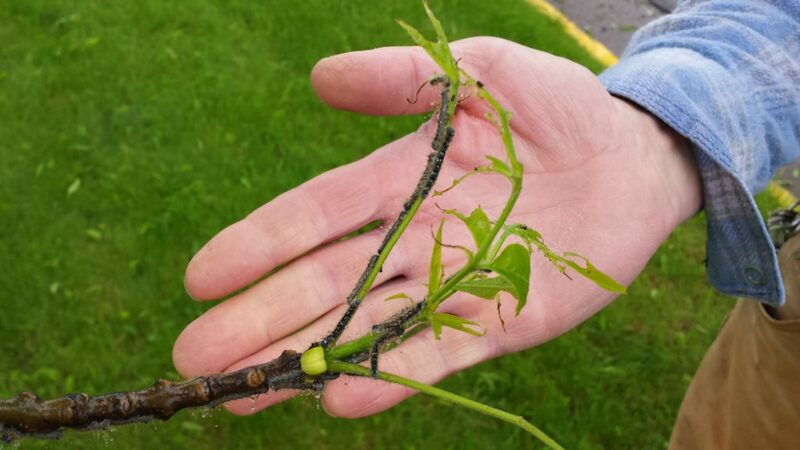 Heterobasidion root disease (HRD), formerly known as annosum root rot, was recently found in Monroe County for the first time in the town of Little Falls. 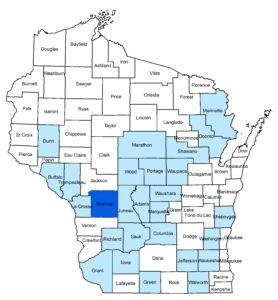 With this detection, HRD is now known to occur in 28 Wisconsin counties. HRD distribution map. Counties where HRD is present are shown in blue with most recently confirmed county shown in dark blue. 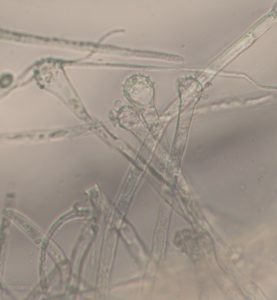 Fruiting bodies of the pathogen, Heterobasidion irregulare, were found on dead overstory red pine and both live and dead white pine saplings in the Big Creek Fishery Area. The 20-acre stand was a red pine plantation established in 1958 and last thinned in 2012. Wood samples were collected to isolate and identify the pathogen through microscopic identification at the Forest Health Lab in Fitchburg. Microscopic spores isolated from wood samples and confirmed as HRD in Forest Health Lab. Based on this new find, a number of townships were added to the 25-mile buffer zones used in determining appropriate management activities according to the HRD Management Guide. There will be a one-year grace period for implementation of the guide in these townships. The Forest Health Program has records of all confirmed HRD detections. 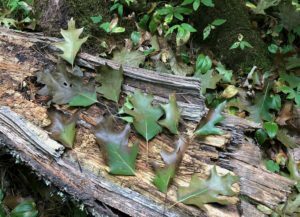 If you suspect this disease is present in a stand, contact your regional forest health specialist. For more information about HRD, visit the DNR Forest Health webpage. Wisconsin Pesticide Applicator Training (PAT) Program with University of Wisconsin Extension is offering one training session for Forestry (Category 2.0) in 2019. The training is a one-day indoor session to review the materials in the training manual. A certification exam will be administered at the end of the day by Wisconsin Department of Agriculture, Trade and Consumer Protection. The PAT Forestry training day is scheduled for January 24, 2019 at the Marathon County Extension Office in Wausau. Preregistration is required and costs $30. For more information and to register, visit the Pesticide Applicator Training website. 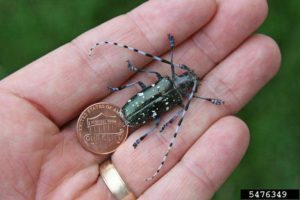 We do NOT have Asian longhorned beetle (ALB) in Wisconsin at this time, but it’s good to be on the lookout for it. Every year folks submit reports of insects that they suspect to be ALB, but to date they have always been confirmed as the native whitespotted sawyer (sometimes called pine sawyer), which attacks stressed conifers rather than the maple and other hardwood species preferred by ALB. If you find a beetle that you suspect to be ALB, please collect the beetle, take some pictures, and send them to your forest health specialist, or to the University of Wisconsin Insect Diagnostic Lab for identification. Asian longhorned beetle is a large beetle. They are smooth and shiny black with white spots and blotches on their wing covers. Photo by Joe Boggs, Ohio State University, bugwood.org. 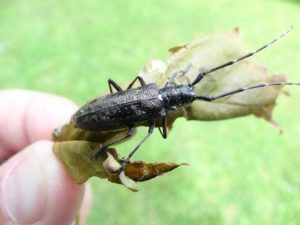 Our native pine sawyer beetle appears dusty or pitted, but is often mistaken for Asian longhorned beetle. Photo by Linda Williams. ALB can be a very destructive pest. It is typically introduced, unintentionally, to new areas via wooden pallets, wood packing materials, or firewood. The Don’t Move Firewood website has some great tips for safe transport of firewood, how to find firewood locally, as well as a list of other invasive insects and diseases to be aware of when buying or using firewood. 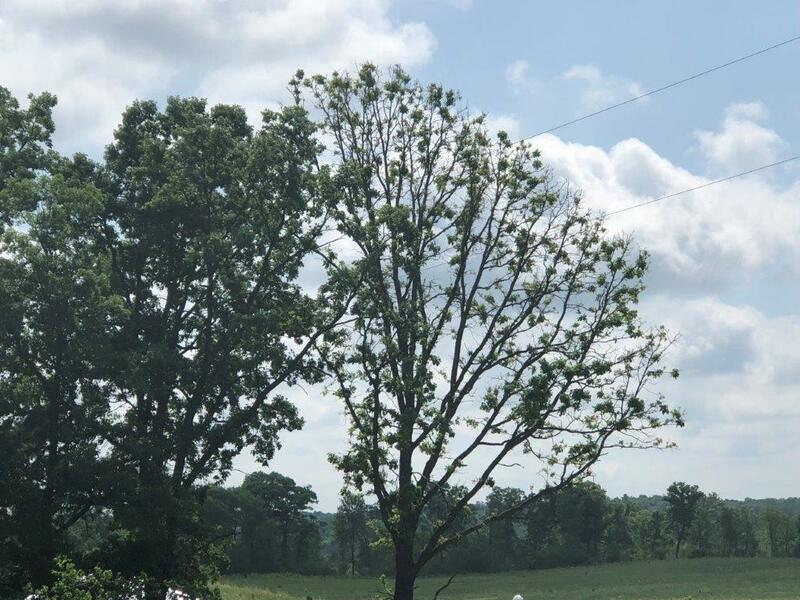 USDA APHIS, which conducts eradication efforts wherever ALB is found, recently announced that an area of Ohio was officially ALB-free, and the quarantine was subsequently removed. Earlier this year in March, a separate area of Ohio was also declared ALB-free. 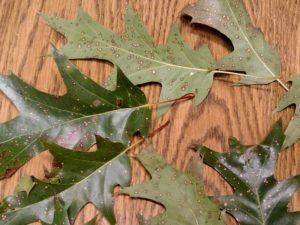 That leaves just one area of Ohio with ALB quarantines still in effect. 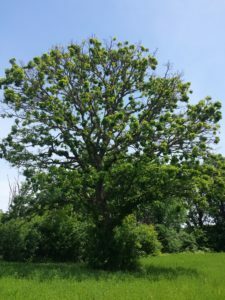 Eradication of ALB can take decades to complete and involves extensive efforts including tree removal and chemical treatments. States with current ALB quarantines include: Massachusetts, New York and Ohio. 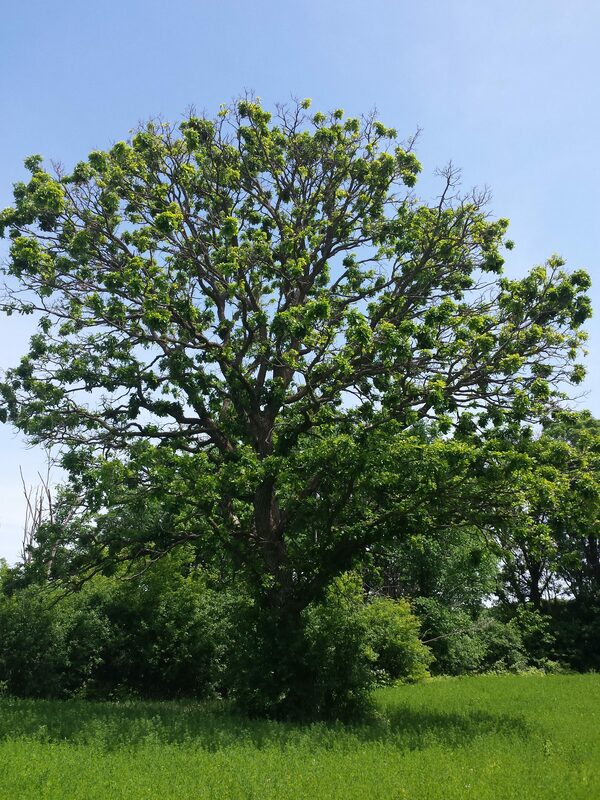 For more info on ALB, check out the USDA APHIS ALB webpage, and as always, please let us know if you think you have come across a forest health concern, including ALB. 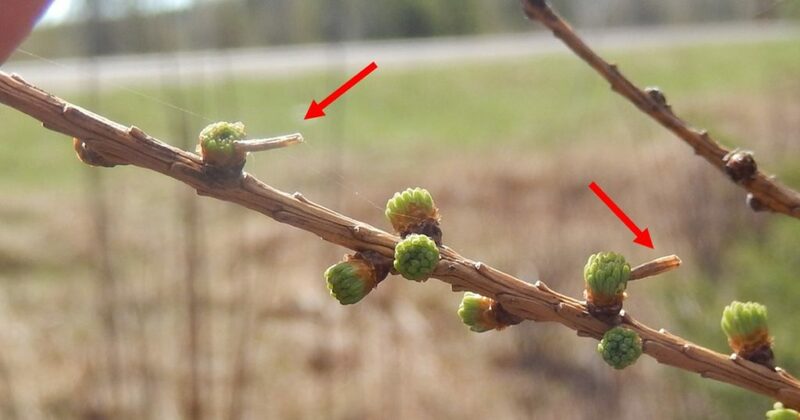 Invasive brown marmorated stink bugs (BMSB) are now well established and reproducing in southern and central Wisconsin. This fall we are getting our first reports of large numbers of BMSB gathering on the sides of houses looking for places to overwinter. This problem will continue to get worse as stink bug populations increase and their range expands. 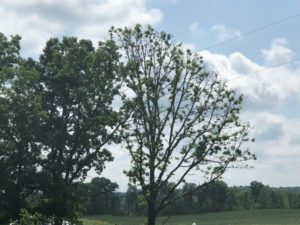 Damage to important crops, ornamental plants and trees will also be a major concern. BMSB is known to feed on a wide variety of plants including apples, tomatoes, corn, soybeans, silver maple and walnut. 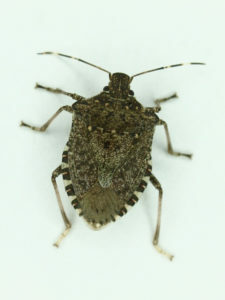 An adult brown marmorated stink bug. Photo by P.J. Liesch, University of Wisconsin Insect Diagnostic Lab. Researchers are working on ways to manage the pesky bugs. One new method being explored is hanging black netting soaked in insecticide at locations where the bugs congregate, such as doors on the north and east sides of structures. Samurai wasps are another promising lead. These stink bug-killing wasps found their way into the U.S. on their own over the past few years, but researchers are also working with lab-reared samurai wasps that they hope to release. Samurai wasps parasitize the eggs of BMSB but do not sting humans or other animals. New forest health specialist Alex Feltmeyer. Photo by Mike Hillstrom. 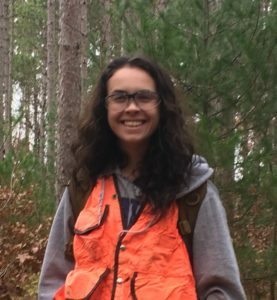 Alexandra (Alex) Feltmeyer started October 15, 2018 as the Forest Health Specialist for the Central Zone (Adams, Green Lake, Lincoln, Marathon, Marquette, Menominee, Oconto, Portage, Shawano, Taylor, Waupaca, Waushara, and Wood counties). Alex will be stationed at the Plover Ranger Station and will start making connections with the foresters and partners in her zone right away. Her contact information is Alexandra.Feltmeyer@wisconsin.gov and 715-340-3810. 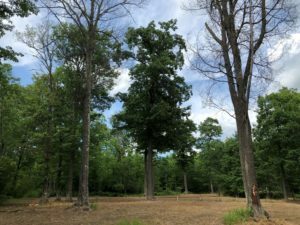 As a reminder, the DNR forest health specialists are available to diagnose and provide management recommendations for forest health concerns such as insect, disease and weather-related damage on forested properties in Wisconsin. The forest health specialists are also available to give presentations and trainings on current insect and disease concerns and management guidelines. 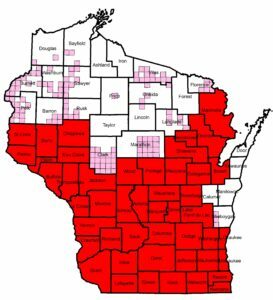 For a full list of forest health program staff and the counties they cover, please visit https://dnr.wi.gov/topic/ForestHealth.